As the European Union introduces a ban on crude oil imports from Iran and tightens sanctions on the country's banks, BBC Persian has been talking to Iranians at home and abroad about the impact on their lives, as Mehrzad Kohanrouz reports. Fereydoun is a 40-year-old from Karaj, south-west of the capital Tehran. He has just been made redundant after 15 years with the state-owned carmaker, Iran Khodro. "I used to have a job assembling Mercedes-Benz cars," says Fereydoun, "but now, because of the sanctions, Daimler has cut its ties with Iran and as a consequence I lost my job. I'm self employed now but I'm struggling to put food on the table." Fereydoun is one of many Iranians now facing hard times as the sanctions against Iran's already struggling economy begin to bite. He says he knows he is lucky to at least have a temporary job. Unemployment is soaring in Iran, especially among the younger generation. The official rate is 14%. But, unofficially, it is much higher. Growing numbers of Iranians now have no steady source of income. It is a grim prospect at a time when the cost of living is soaring. Pirouz, a university professor in Tehran, says he is finding it increasingly hard to make ends meet. "I live alone," he says. "I used to spend about $300 every month on living expenses, but now I am paying more than $650." Rising prices have been compounded by recent economic reforms, which saw state subsidies on petrol and utilities being phased out. Like most Iranians, Pirouz receives a monthly payment of $30 from the state to help cope with the new higher prices, but he says that it is simply not enough. For people in business the sanctions are definitely making life much more difficult. "The sanctions mean that it is impossible to transfer foreign currency," says Ravan, a businessman from Tehran. "My business has been left with a huge load of debt. Thousands of people in my position have gone bust." "In the past few weeks, the prices of goods in my sector have been changing on a daily basis," says Sharouz, who imports camera systems for automatic doors in shops and offices. "I agree a price today, but by the time I go to sign the contract the following day the price has already gone up and yesterday's deal has been cancelled." In an article for the popular Khabar website, political analyst Mohammad Irani recently lambasted the government for its failure to address the problem. "If you complain, all you hear is: 'Don't you live in this country? You should know it's because of the sanctions'," he wrote. "But if you want to overcome a crisis or challenge you've got to admit that it exists, and not just dismiss it." The growing feeling of crisis has seen many Iranians rushing to convert their savings into dollars. As a result Iran's currency, the rial, has plunged to record lows in the past couple of weeks. "I don't know how I can cope," Saeed, a student, wrote in an email. "The rate for foreign currency is rising by the hour." In response, the government has ordered exchange bureaux to stop selling dollars, unofficial street dealers have been threatened with arrest and prosecution and the central bank has warned that anyone carrying foreign currency must provide a bank receipt or risk being arrested. In another sign of just how seriously the government is taking the situation, Iranians recently found that not only had the authorities blocked access to financial websites showing real-time exchange rates, but it was no longer possible even to use keywords like "dollar". Gold prices have also rocketed in Iran as people have put their savings into gold coins. The price of a gold coin - the way the gold price is measured in Iran - now stands at $500, more than double what it was a couple of years ago. The price of gold coins is particularly significant in Iran because when young people get married, the "mehrieh" or "bride price" - the money the husband will pay his wife if they get divorced - is usually agreed in gold coins. For a country with a high divorce rate, it is a big problem. "I'm thinking of all those poor husbands," says Matin in an email. "How will they ever be able to pay if their wife decides to get a divorce?" The sanctions are also having an impact on Iranians living abroad. Ehsan, a student in Malaysia, said it was getting really difficult for his family to send money to him. "Many people I know have given up and gone home," he says. Nazy, who is studying in India, said her problems were being made worse by traders taking advantage of the plunging value of the rial. "Currency exchange here is a rip-off," she complains. "The touts will get huge commission and charge as much as they wish as Iranian rial falls." So how do people feel about the rights and wrongs of the sanctions? If the calls and messages to BBC Persian are an indication, then emotions are very mixed. "These sanctions are pointless," says Hadi. "The regime's rulers have already filled their pockets with our country's money, so it won't affect them. It will just be the people of Iran who suffer." But Mehrdad says: "There's no other option. Sometimes you have to choose between the bad and something worse. The international community has to choose between military action or intensifying the sanctions." "The sanctions will have no effect on changing Iran's decisions about its nuclear programme," says Navid. "Iran's dependence on the West will be minimised and... it will benefit Russia and the East." 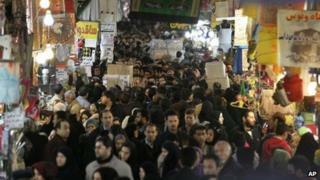 But despite the difficulties they now face, many Iranians remain convinced that one day things will get better. Fereydoun, the former car worker from Karaj, remains upbeat. "Things are tough and I'm unemployed as a result of sanctions, but no doubt the future is ours," he says. "We'll withstand all the pressure so that we can turn the corner and that the next generation... can live in a strong Iran later on."